Abraham Ayres was in business with his partner, Joseph Taylor, as Ayres & Taylor from approx. 1852 to 1862. The foundry was located at 158-160 W. 40th St. near 8th Ave. Ayres & Taylor were among the contractors that supplied cast- and wrought-iron to the construction of New York's Crystal Palace at 5th Ave. and 42nd St. in 1853. 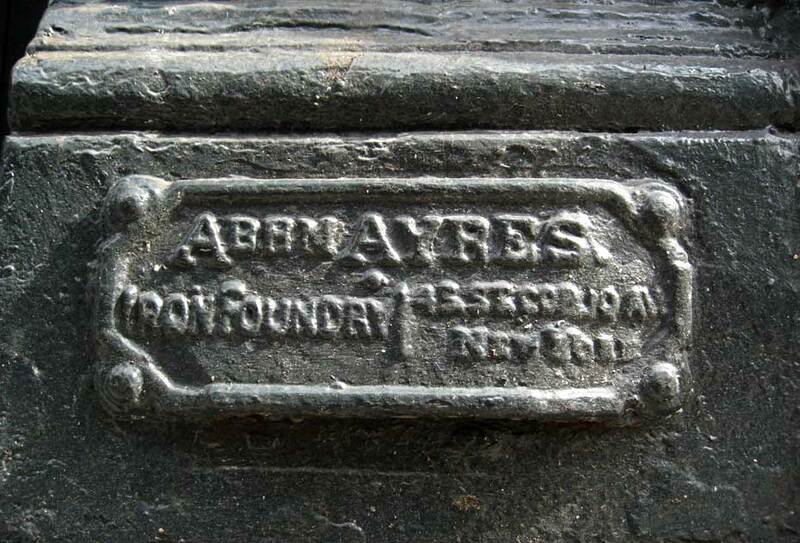 By 1865 Abraham Ayres had brought his sons into the business. These were Zephaniah S. Ayres and Crittenden Ayres. A few years later Zephaniah Ayres formed a partnership with James McCandless, Ayres & McCandless. 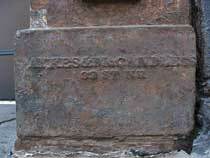 This foundry was located first at 553 W. 33rd St. and later at 623-625 10th Ave. (corner of 45th St.). 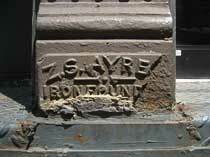 Most of the surviving (by 2009) Ayres-related cast-iron shop fronts in New York bear the mark Ayres & McCandless. 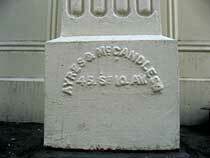 I found only one Ayres & McCandless mark with their 33rd St. address (33 St. NR) on the North River (Hudson River). 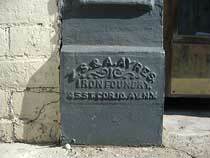 From 1870 to 1894 the Ayres foundries were located at 623-625 10th Ave. at the corner of 45th St. The buildings on 45th St. were numbered 500-506. This was the business address of Ayres & McCandless (1870-1877), A. Ayres & Son(s) (1870-1881), Zephaniah S. Ayres (1870-1886), and Abraham Ayres (1870-1894). Abraham Ayres died in 1897. The death notice reads simply, "Ayres - On Friday, July 9, 1897, Abraham Ayres, in the eighty-first year of his age. Services at his late residence, 261 West Eighty-eighth Street, on Sunday afternoon at 4 o'clock. Interment at the convenience of the family. Kindly omit flowers." Later in the year, a story in the New York Times, 21 Nov. 1897, p. 5, reported that the will of Abraham Ayres, "a wealthy iron manufacturer of this city," had been contested by his grandson, "Abraham C. Ayres, a student at Princeton and a member of this year's football team." Nearly all of the estate valued at $300,000, "by the terms of the will, was to go to the widow, Matilda W. Ayres." Several Z. S. Ayres marks carry the address 45th St. corner of 10th Ave. These probably date from after the dissolution of the Ayres & McCandless partnership (i.e., between 1877 and 1886). In 1877 Zephaniah S. Ayres, age 34, applied for a passport, where he stated that he was born 29 July 1842 in New York. The reason for his trip is somewhat interesting. As reported in the New York Times, 30 Oct. 1877, p. 8, "Clements White was married to Miss Mary M. Edsall at Tarrytown on Aug. 6, 1872, and they lived happily together until last Summer... Last Summer he took his family to a place in New-Jersey to spend the season. While there Mrs. White made the acquaintance of Zephaniah S. Ayres, a wealthy young married man. Their acquaintance ripened into intimacy, and in the early part of August, Ayres induced her to elope with him... Accordingly, on Aug. 7, she left the house, and meeting Ayres by appointment, went with him on board the steam-ship Periere of the Transatlantic Company's line. The steam-ship sailed that day and carried on board Ayres and Mrs. White, whose names appeared on the list of passengers as 'Mr. Z. S. Ayres and Mme. Z. S. Ayres.' She went with Ayres to Paris and elsewhere, the two traveling as husband and wife. On the 8th inst. she returned with Ayres to this City and he is said to be now supporting her as his mistress. Mr. White was almost dumfounded at discovering his wife's infidelity. He brought a suit in the Court of Common Pleas to recover $20,000 damages from Ayres on account of the latter's misconduct ... and obtained an order of arrest against Ayres. The latter was arrested by the Sheriff, and was held in $2,000 bail... A strange part of the story is in the conduct of Ayres' wife, who is a very handsome and accomplished woman. It was a crushing blow to her to learn of her husband's wrong-doing, and she has suffered greatly in consequence; but when he returned to this City she had no reproaches to vent on him. She is still living with him, and tried to induce White to take back his wife and live with her again. She says that she married her husband for better or worse, and considers it her duty to cleave to him, no matter what happens." This broad-minded view on the part of Mrs. Ayres, however, seems to have reached its limit in 1892, when she read in a newspaper that the "beloved wife of Z. S. Ayres" had died. This story appeared in the New York Times, 9 Oct. 1892, p. 10: "Mrs. Ayres, the wife of Zephaniah S. Ayres, proprietor of the iron foundry at 506 to 522 West Forty-fifth Street, is an angry woman. In one of the morning newspapers of Sept. 15 she read a death notice of 'Nellie H., beloved wife of Z. S. Ayres, aged twenty-seven years.' The funeral, the notice stated, was to take place from the woman's residence 318 West 32d Street on the 16th, three days after her death. The Mrs. Ayres who read this notice separated from her husband four years ago on account of his unfaithfulness. He was especially infatuated, it is said, with a girl named Nellie Smith, living at 50 Sands Street, Brooklyn. Ayres paid his wife $50 a week for some time, afterward cutting it down to $25 without any remonstrance on her part. Ayres, it is alleged, went to live with the Smith girl, and his seven-year-old daughter Edith was given into the charge of Mrs. Ayres's mother at Arlington, N. J. The death notice proved too much for Mrs. Ayres's patience. She has engaged lawyers to present her case in a suit for divorce." A manhole cover marked "A Ayres 45 St & 10 Ave" is found on Laight St. at the corner of Greenwich St.